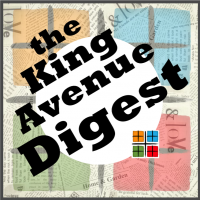 Check out the featured announcements on the King Avenue Digest, and click on the links to read more. The rest of the Digest has more comprehensive happenings organized by ministry/category announcements that pertain to you. You can also download the Carillon and Calendar to get the full picture! Download the February Carillon Newsletter. Diana Sells, Finance Manager, and Rebecca Naas, Stewardship Secretary, have resigned their positions effective December 31, 2017. Both Diana and Rebecca have served King Avenue faithfully and well for many years. They have seen us through much transition and brought great clarity to our church's financial picture. They created a model finance office. We are thankful for their service and wish them God's blessings in the future. King Avenue welcomes Cyndi Black Colburn and Charlene Dubin as our new Finance Manager and Stewardship Secretary respectively. We look forward to having them on the staff. In January and February, King Avenue will be collecting items for Blessing Bags to support the Open Shelter and Faith Mission shelters. Gallon sized bags with lists of items will be available at a table between services starting January 7, 2018. Bags are due back filled by Sunday February 25. Drop-in Small Group Discussion beginning February 4. Join us for an Ash Wednesday service of imposition of ashes and Hoy communion. The service begins at 7:00pm in the King Avenue Sanctuary. All are are welcome. Check out the Preaching Text page on our website for listing of the scriptures to be used in sermons. During Lent the sermons will draw upon Abraham Heschel's book Sabbath. For added enrichment, you may want to obtain this brief book. The next session of classes for persons interested in becoming a member of King Avenue UMC will be held Sunday mornings, 10 – 10:45am, January 7 through February 4 with the ritual of membership on February 11, 2018. Sunday mornings in the Logos Lounge (L-1) college students come together to share in faith and process life opportunities, challenges, and questions together. Each week begins with a Bible study, devotions, and prayer. Then the floor will be open to discuss life, current events, and issues facing the church. In the midst of our discussions, we’ll seek to listen to and learn from what God’s Word reveals and to be respectful and supportive of one another. Come and be among “open hearts, open minds, and open doors.” Here at King Ave Campus Ministry ALL are Welcome! CLICK HERE to register on Realm by February 16th. The Worship and Arts Committee is sponsoring an exhibit, RESOLUTIONS, in the gallery for January and February, 2018. Performances Thursday, March 8 at 7:30pm, Friday, March 9 at 7:30pm, Saturday, March 10 at 7:30pm, and Sunday, March 11 at 3:00pm. Admission is free, but a $10 donation is recommended. Auditions – April 8 and April 9 at 6:30pm. MISCAST CABARET will be performed, one night only, at King Avenue UMC on Saturday, May 19.